“Mrs Rena is a very good cook. She has many secrets and her speciality is making things with red sauce. She is very well known for this”. Rena’s food has a reputation among the Kos Town community. While drinking my coffee this morning, owners of Mikro Cafe, Giorgos and his wife Katerina, told me they were neighbours of Rena before she moved to Lagoudi Village; often eating all together during Sunday lunch. Kokoras Krasatos is considered ‘special occasion’ food and is traditionally eaten on Christmas day, particularly as means to break the fast, practised for forty days before Christmas. Rena sometimes cooks Kokoras Krasatos for Sunday lunch; one of the most important meals of the week; a time where her family and close friends eat together. 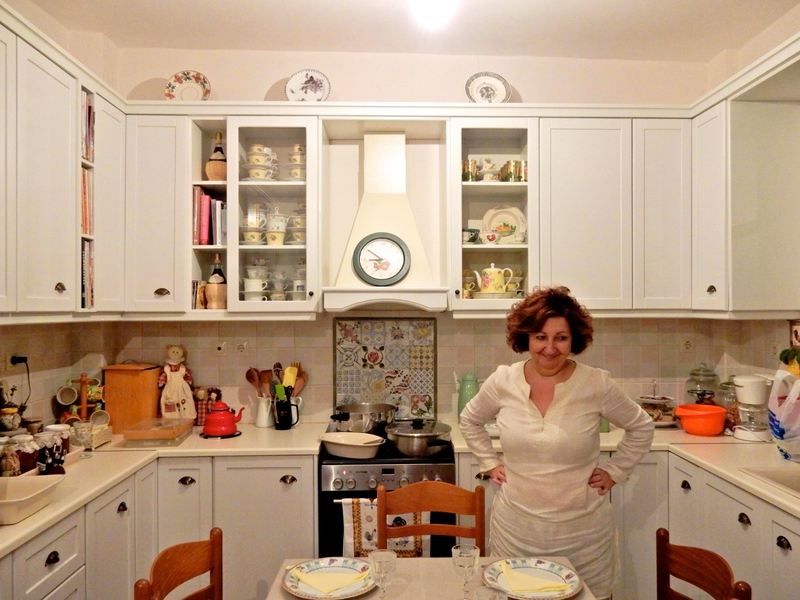 Rena’s kitchen channels a French provincial aesthetic. The space is host to both her meal gatherings, a tribute to her attention to detail, and to her love of decorating. Rena previously owned a children’s clothing boutique for 25 years and one of her favourite activities was designing the window displays at Christmas time. Rena’s attention to detail is also symbolised through her catering to the specific tastes friends and family. For her guests, Rena had cola light for Dimitra, special sugar for Mary and, on this occasion, Rena used less pepper in her Kokoras Krasatos to suit to the taste of friend’s husband. Allow to simmer for approximately one hour and stand before serving.